At age 88, Fred Oliver is learning how to read better, so he spends several hours a week of his retirement years at The Literacy Council (TLC) of Central Alabama. “I want to be able to read better than I already do,” he said. When Oliver starts telling a story, he sits up just a little bit straighter in his chair as he speaks. His eyes, turned a watery blue from 88 years of seeing, focus on some memory invisible to the listener. He recounts the day the Japanese bombed Pearl Harbor: he was a young man sitting in church, where his adoptive father was preaching, and the police came into the church and warned about the attack. He recalls the time he met Jackie Robinson: he was having breakfast in a Connecticut hotel and the baseball legend walked right over to him. He recollects when he saw James Brown at the Apollo Theater in Harlem. While sharing stories about the many things he’s seen and places he’s lived—he spent most of his adult years in New Jersey—Oliver also reveals that he quit school at an early age to work after his adoptive father died, so he never really learned how to read. He did, however, learn a lot of on-the-job skills. At the City Ice Co., formerly located on Birmingham’s Southside, he learned how to haul ice and earned $21 a week doing so. At a local slaughterhouse, he learned how to skin cattle, debone hams, and cure bacon, earning $100 a week. At a New Jersey bread bakery, he learned how to drive a tractor trailer, repair cars, and do just about every other job at the company. Oliver drives from his home in Birmingham’s Acipco-Finley neighborhood just about every Tuesday and Wednesday to TLC’s bright, book-filled First Avenue North location. Oliver, commonly called “Mr. 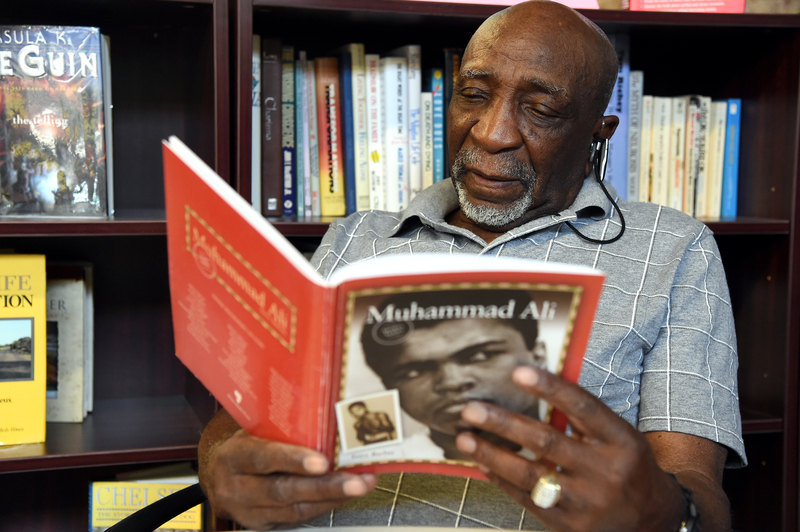 Fred,” works one-one-one with his tutors, Randy Kaplan and Ginny Fletcher, reading books written specifically for adults learning to read, including titles about historical figures like Eleanor Roosevelt and Muhammad Ali. Oliver resumes his storytelling. He talks about the two years he served in the Korean War and recalls when he shook President Harry Truman’s hand and met entertainer Nat King Cole. Suddenly, he pauses and shoots a skeptical look straight ahead. “Now, how much of this are you going to use?” he asks. Oliver doesn’t want all of his stories told—at least, not this way. Oliver has a new, fancy computer that he can speak into and record his stories. He hasn’t done it yet, but he says he will. He really wants to write them down, though. “My spelling has gotten worse,” he admits. Oliver grew up with two cows and a hog in Evergreen Bottom in Birmingham. He was delivered by a black midwife inside a tiny house that has since vanished. And he talks a lot about his adoptive father, the wise preacher. “He knew how to speak Chinese. He worked on the railroads way back alongside Chinese immigrants. … He was a very smart man,” he said. Oliver tells a story about how he taught his son, who was not a strong reader, how to read. He recalls that a few years back, his daughter warned her brother not to bother their father because he was in school. “School to study what?” Oliver’s son asked. “To learn how to read,” his daughter replied. Oliver’s son was in disbelief: “That can’t be. You taught me how to read,” he said to his father. “All of my children got good educations,” Oliver said. Let Oliver tell it, he came to the decision on his own to formally learn how to read. For many years, he has been a student at one school or another. Several years ago, he filled out a card to request information about adult-literacy programs. When the information was mailed back to him, he found out about TLC. Before that, Oliver explains that he went to schools in East Lake and Trussville to study for his GED diploma, which he is still working toward. A little later and after a little prying, he adds that his second wife, Norma Oliver, who died a few years ago, encouraged him to learn how to read so he could handle his personal affairs once she was gone. Either way, he decided to come to TLC and stick with it. “The people here are nice,” he said. “He came to us when he was 82,” recalled TLC Director of Adult Literacy Programs Adrienne Marshall, who was Oliver’s first tutor—long before she became part of the organization’s staff. Marshall said she has seen many people come through TLC’s doors seeking independence. “That is what drives everyone, wanting to be independent,” she said. Oliver said he will keep coming—remember, he wants to write that book. He wants to read the Bible from cover to cover, and he wants to keep learning. “It keeps my mind open,” Oliver said.